A Hollywood hotspot that offers American food with a twist. Like their Vegas location, you enter this club-y lounge/restaurant through a “pawn shop” into the restaurant behind. 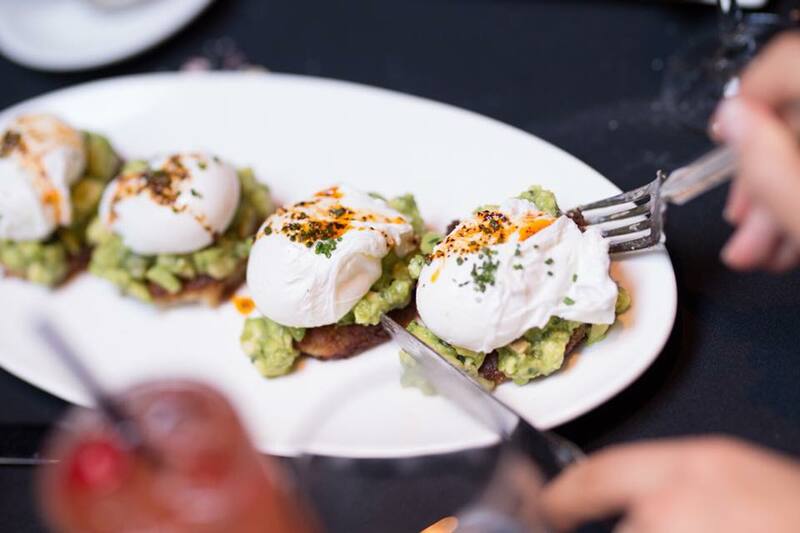 By Chef Chris Santos, the restaurant's DineLA menu is filled with sweet and savory dishes like “oreo pancakes” and “avocado latke benedict” which sound just divine (they had us at “oreo"). The 2 course meal is a reasonable $25/person-- which is almost affordable considering the usual prices. Originally located in West LA, Fundamental has opened a new, beautiful location in DTLA and we’re dying to take a visit. Decorated with bohemian and mid-century modern pieces, the location is design heaven. Aside from beautiful look, Fundamental DTLA is offering a great lunch deal with a variety of options to choose from such as the “free-range fried chicken” sandwich or a classic “turkey breast” sandwich and more. You can get a Sandwich + salad/soup + side + 1 cookie + 1 drink for $15/person! Not bad. Located inside the glamorous and upscale Montage Beverly Hills, Georgie offers some solid American modern lunch options, with choices like the “Georgie burger” and “Sunny egg on avocado toast" (or for a fancier choice, try the “Crab Tagliatelle”). And don’t forget, the $30, 3-course lunch deal comes with an appetizer and dessert. A new and super cool spot in Mar Vista, Little Fatty offers delicious and savory Chinese and Taiwanese dishes such as the classic “Orange Chicken” and “Walnut Shrimp.” But what we’re really eyeing is the XO fatty noodles with bean sprouts and garlic chives off of the DineLa menu, which includes a starter + Entree for $15/ person! A new gorgeous sea-inspired restaurant located in the Beverly Center, Cal Mare offers delicious coastal Italian cuisine. Dishes like the eye-catching sea urchin appetizer, the “Cavolfiore Arcobaleno,” might momentarily trick you into feeling like you’re eating under the Amalfi Coast Sun. Not a seafood fan? Don’t worry. They have other Italian classics such as the “Pizza Alla Carbonara” as part of their 4 course dinner for $49/ person. Located in bustling downtown LA, Rossoblu has a beautifully renovated industrial space with rustic details and draws in customers for their authentic Bologna-inspired Italian cuisine. They have wonderfully classic and hearty dishes like “Lasagne Bolognese” and “Roasted Lamb Shoulder,” all included in their 3-course offering for $39/ person. A rustic venue with a dark-toned interior and complementary mid-century modern wood pieces, Lunetta is a hip, chic spot located in breezy Santa Monica. With the menu offering seasonal dishes featuring local farmer's market products, you can anticipate fresh and quality dishes such as “Pan Roasted Norwegian Halibut” and “Homemade Spinach Pappardelle." For DineLa, they're offering a lovely 3 course dinner for $49/ person.